In preparation for tonight’s big I-75 Rivalry game between the University of Toledo and the Bowling Green State University! Tailgating before a game is a longstanding tradition. The right pregame food, drinks, music, and games help get everyone in the spirit to cheer on their team. When thousands of enthusiastic people gather in one place, what could go wrong? Unfortunately, plenty. Someone could get injured, your car could get vandalized, or you could end up with food poisoning. We at Acuity want to help take the worry out of tailgating so you can enjoy the event—even if your team loses. 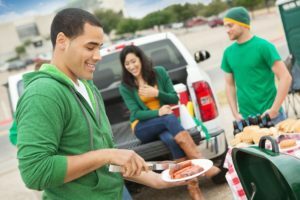 Whether you’re a tailgating rookie or a seasoned veteran, here are some tips to make your next tailgating experience a safe and fun one. •Set the time and place. Notify your friends and family when and where you are going to set up. Check with the stadium in advance to see what time the gates open. Before heading into the game, make sure everyone in your group is aware of your meeting spot in case anyone is separated by the crowd. •Prepare food and supplies. Packing food and supplies ahead of time will help make sure you and your crew are ready to go. Fill a cooler with plenty of ice to keep drinks cool and perishable food safe to eat. Napkins, plates, and tablecloths are essential. Don’t forget grilling and serving utensils! •Safety first. Hand sanitizer should always be on your list. If grilling, make sure your grill is clean before you go, and bring along a fire extinguisher. Ensure coals are completely cooled before disposing of them. Perishable food that wasn’t eaten should be placed in the cooler or thrown away before going into the stadium. •Check the forecast. Depending on the weather, you may need an umbrella (tonight for sure!) or ponchos, sunscreen, or insect repellent. Dress appropriately so you are comfortable before, during, and after the game. •Select a designated driver. Don’t drink and drive or let anyone else do so. •Hide valuables. To help prevent theft, remove or hide any valuable items in your car. •Leave safely. Make sure all items are cleaned up before the game starts and before driving away. A flat tire is never fun.